Though best known for his interactions with most of the leading literary figures of his day, Henry Crabb Robinson (1775-1867) was an important writer and thinker in his own right, especially in the dissemination of German thought in England. Between 1800 and 1805, he spent three years as a student at the University of Jena, writing pioneering articles on Kant, Schelling, and the rapidly developing field of aesthetics for publication in London. Though he had briefly experimented with Godwinian scepticism in the 1790s, after his return from Germany in 1805 he identified himself as a ‘rational dissenter’, worshipping among the Unitarians. After a brief stint covering the Peninsular war as a correspondent for the London Times (1808-9), Robinson spent fifteen years as a solicitor (1813-28), living mostly in the vicinity of Russell Square. 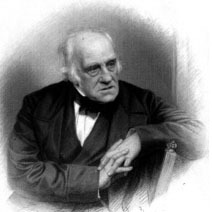 In retirement, he took an active role in the University of London, Unitarian affairs, and the literary, artistic, and political life of London until his death in 1867. The Robinson archive, one of the most important collections belonging to Dr Williams’s Library, contains thirty-three volumes of his Diary (1811-67), twenty-nine volumes of Travel Diaries (1801-66), four volumes of Reminiscences (1775-1843), numerous pocket diaries, and more than thirty volumes of correspondence and other papers. The Diaries and Reminiscences total more than four million words. Within these materials are important accounts of literary figures Robinson met and, in many cases, corresponded with during the course of his long life, including William Blake, Samuel Taylor Coleridge, William Godwin, Mary Hays, William Hazlitt, Charles and Mary Lamb, Harriet Martineau, Robert Southey, Dorothy and William Wordsworth, and major German writers such as Goethe, Schiller, the Schlegel brothers, and Tieck. Only a small portion of Robinson’s literary remains have been published. Scholars still rely on Thomas Sadler’s Diary, Reminiscences and Correspondence (3 vols, 1869) and Edith Morley's Henry Crabb Robinson on Books and their Writers (3 vols, 1938), both highly selective and, in Sadler’s case, not altogether accurate. Other works on Robinson include John Milton Baker’s Henry Crabb Robinson of Bury, Jena, The Times, and Russell Square (1937), Hertha Marquardt's Henry Crabb Robinson und seine deutschen Freunde (2 vols, 1964, 1967), Eugene Stelzig’s Henry Crabb Robinson in Germany: A Study in Nineteenth-Century Life Writing (2010), and James Vigus’ s Henry Crabb Robinson: Essays on Kant, Schelling, and German Aesthetics (2010).